Your networked office equipment provides you with a wealth of solutions to improve productivity and reduce expenses. While these benefits are essential for the modern organization, office equipment that's connected to your company network can also pose some serious security risks. And while you should be concerned, there are steps you can take to reduce your risks. The unfortunate reality for today's businesses is that security must take very high priority. Leaving anything to chance opens the door for hackers to infiltrate your network and gain access to your stored confidential information. Here are five ways you can reduce your company's risk of an attack via your networked office equipment. Choose a secure location. Much of today's printed information is protected by compliance laws, and protecting your confidential company information should be a routine practice. Locating printers away from common areas is one way to reduce theft. Use password protection. Change default passwords and require employees to use a password to access your multifunction system's touchscreen interface. Encrypt all data. Your data is vulnerable when it's traveling through your network on its way to and from your office equipment. Encryption is an added protection if an oversight allows a hacker into your systems. Implement pull printing. Pull printing prevents employees from releasing documents to print trays until they're present at the device. Protect the hard drive. 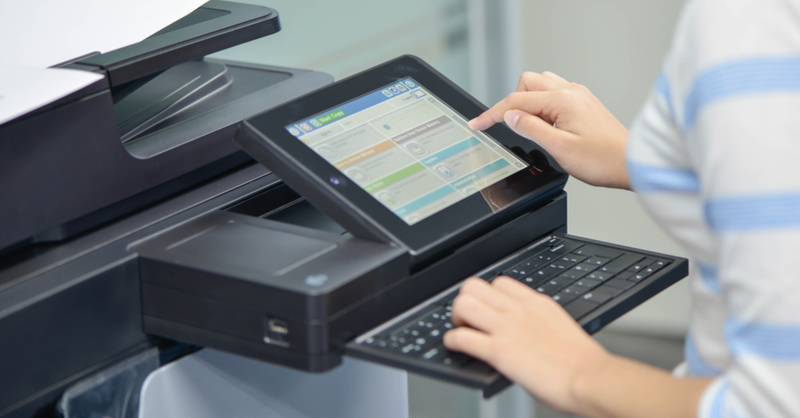 When employees use your multifunction system to scan or retrieve documents, the device saves a copy to the hard drive. Encryption is essential, but you should also clear the hard drive on a regularly scheduled basis, including at the end of your lease agreement. Need some help securing your office equipment? Our Rules-Based Printing solution can help your company reduce costs and secure your information. Contact us at American Business Equipment to find out more today!